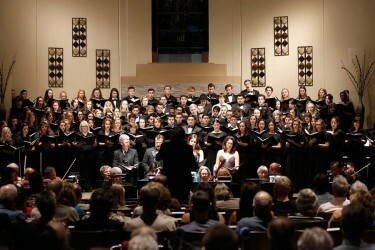 First Southern Baptist Church was at near capacity for Tuesday night’s choral concert. The concert at First Southern Baptist Church was the first of the season for the department and its Canyon Choral Society, formerly known as the Choral Union. 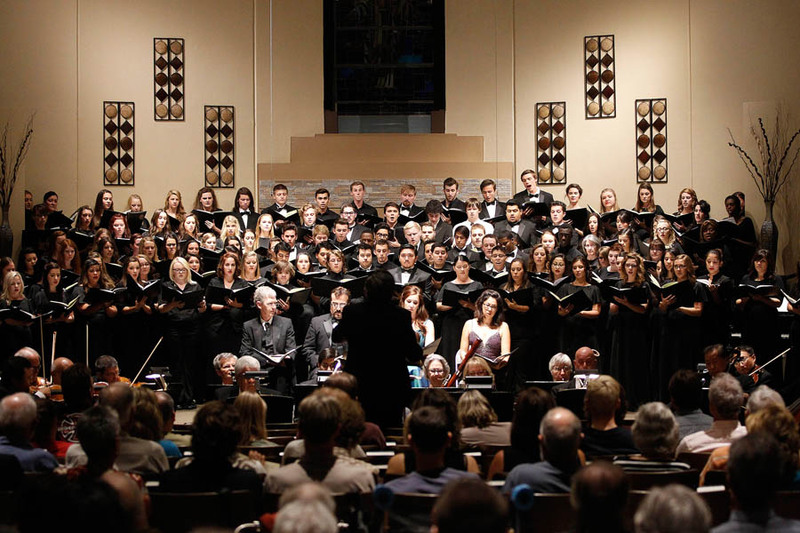 This is GCU’s community choir, open to all, and it was accompanied by a professional orchestral ensemble now being called the Canyon Symphony Orchestra, all under the direction of Assistant Dean Juan Hernandez of the College of Fine Arts and Production. A fall festival, envisioned by Hernandez, would invite high school choirs and musicians to participate in works such as those performed Tuesday. Local high schools already have shown interest, Hernandez said. The concept is similar to what GCU already does with its production of “Handel’s Messiah,” which will be performed for a third successive year on Dec. 5 in the Arena. The Beethoven program led with the 50-minute “Mass in C,” sung in Latin, with the stage barely able to accommodate the 100-voice choir. Lyrics of the Mass were familiar to many in the audience, particularly the Credo — perhaps better known to churchgoers as the Nicene Creed. Soloists from the Phoenix community were Jennifer Song (soprano), Cassie Cardenas (mezzo-soprano), Ken Goodenberger (tenor) and David Topping (baritone). The spectacular skills of pianist Mark Fearey, a GCU music instructor, were on full display in the 20-minute “Choral Fantasy,” sung in German after a 20-minute intermission. The work’s thundering solo introduction was performed magnificently by Fearey, who is more often heard in the role of accompanist to GCU’s choirs.